MAD Offers This New Year! Christmas might be the season to be jolly, but the MAD group of bars and restaurants has got a host of food and drink deals to keep sprits high right through January. 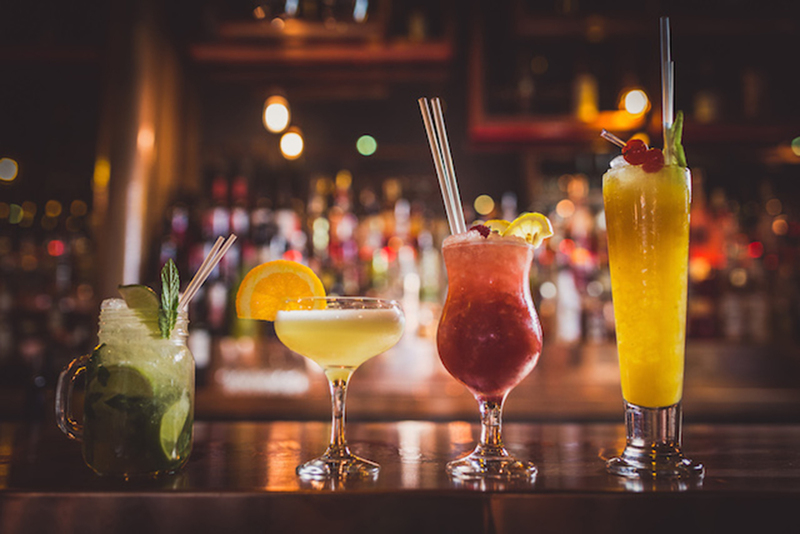 There’s 50% off food, FREE kid’s meals, pizzas and beers for £10 and £5 cocktails to enjoy all month – and that’s to name but a few! ROSYLEE: 50% off Food, All Day, Every Day! Cooking in January? No thanks! 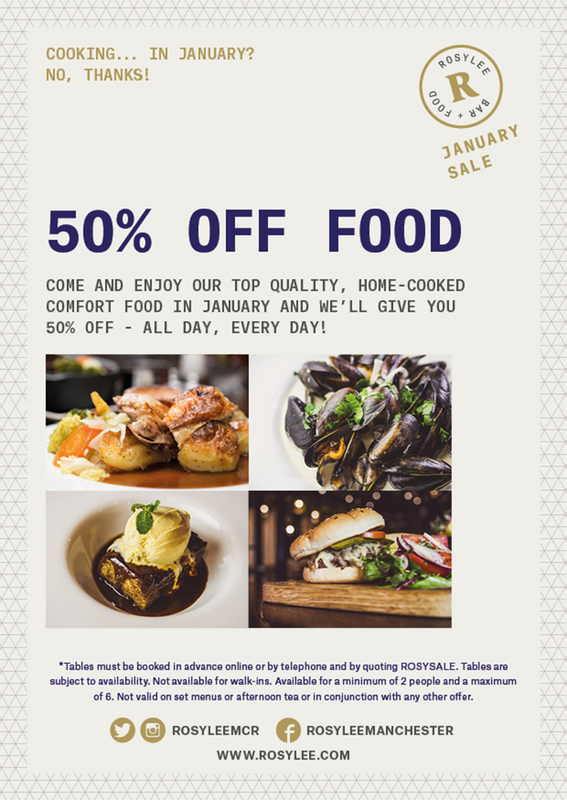 And you don’t have to thanks to Rosylee, who are offering 50% off their delicious, home-comforts menu throughout the whole month. So that’s burgers, steaks, home-made pies and all their fabulous desserts – perfect for perking you up in the dark days of January. 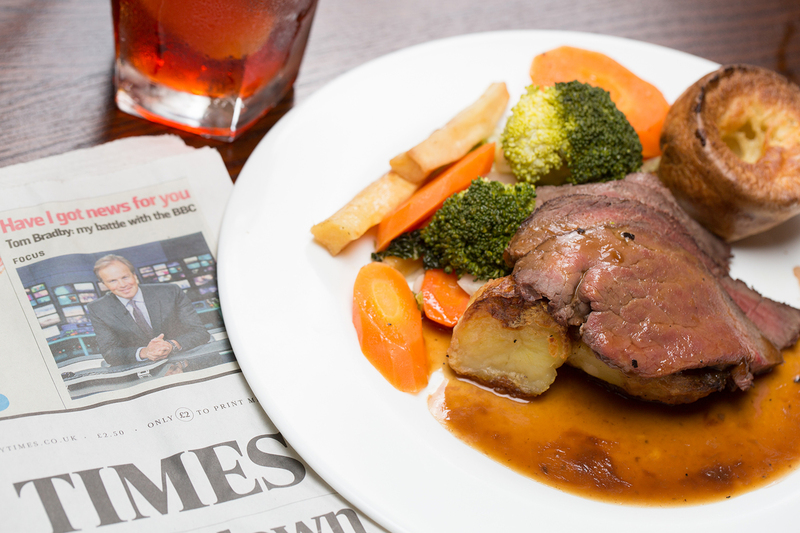 You’ll get 50% off every item on the main food menu, including breakfast and their mouth-watering roasts dinners on a Sunday. Offer is available every day in January. 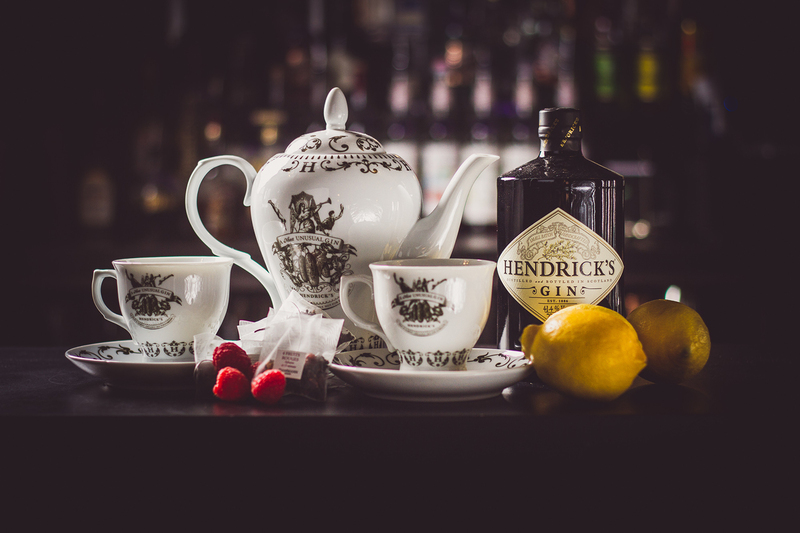 T&Cs: Must book a table in advance by telephone or online, as there is limited availability. Not valid on set menus/afternoon tea. 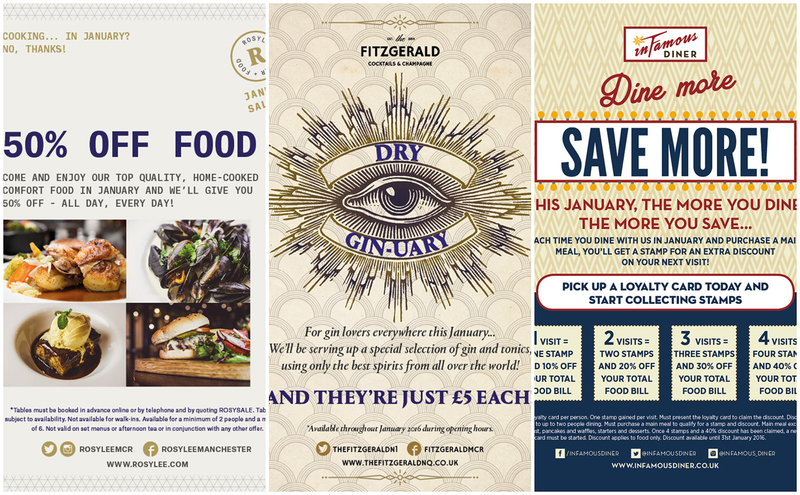 For gin lovers everywhere, especially those that will not be partaking in dry January, The Fitzgerald is the place to head to. 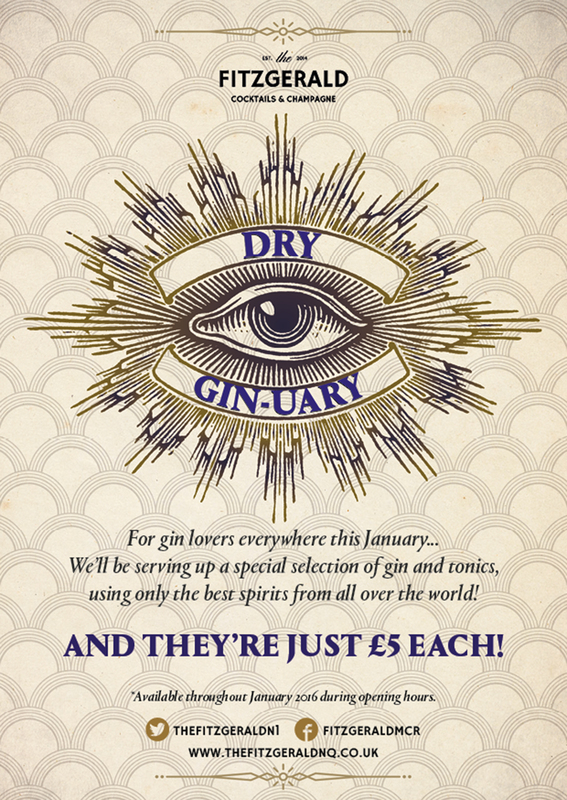 They are serving up speciality Gin & Tonics made with premium spirits from all over the globe, for just £5, throughout January. Offer is available during opening hours, until 31st January 2016. 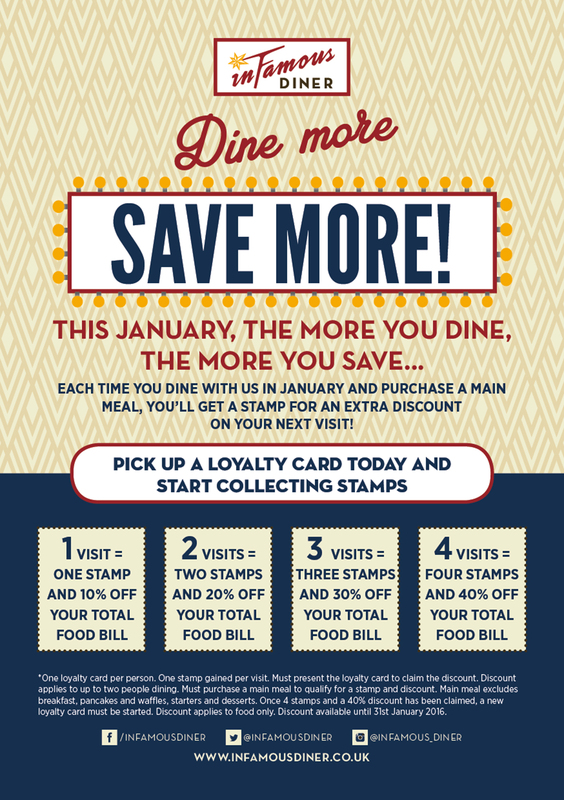 INFAMOUS DINER: The more you dine, the more you save! If dieting just isn’t your thing, but naughty American food is, then head to Infamous Diner in January where the more you dine, the more you will save off our food bill – up to 40% in fact! Customers can pick up a loyalty card from 2nd January and start collecting stamps and discounts. Each visit will earn you another 10% off the next, with up to 40% off available to collect. T&Cs; One loyalty card per person. One stamp gained per visit. Must present the loyalty card to claim the discount. Discount applies to up to 2 people in a party. Must purchase a main meal to qualify. Main meal excludes breakfast, pancakes and waffles, starters and desserts. Once 4 stamps and a 40% discount has been claimed, must start collecting stamps with a new card for further discount. Applies to food only. Not valid in conjunction with any other offer. 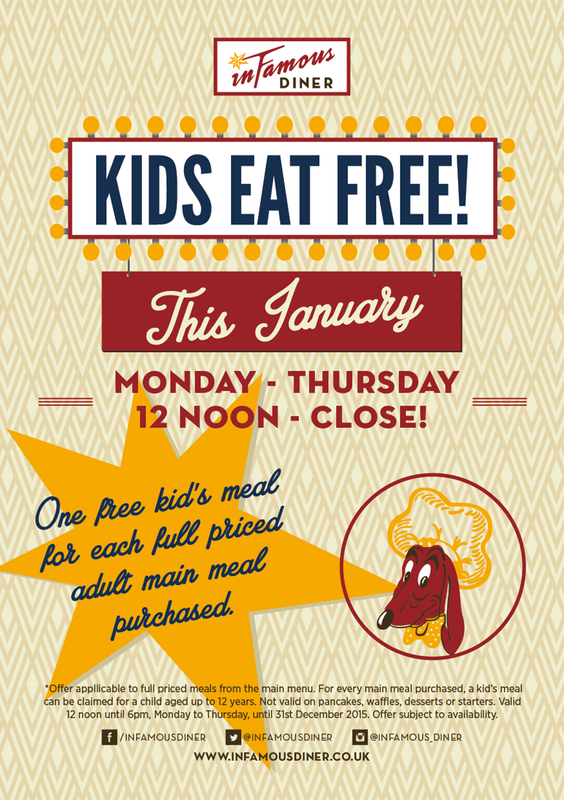 INFAMOUS DINER: Kids eat for free! 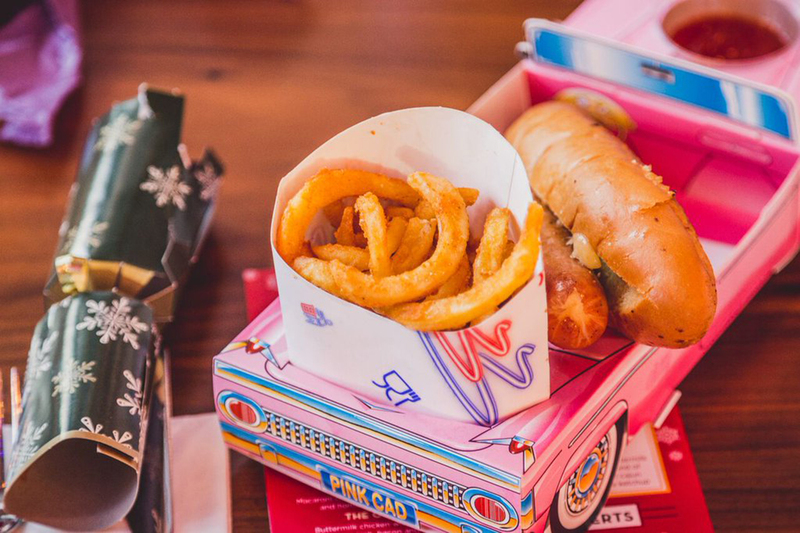 If you want to treat the kid’s to a meal out, but don’t want to break the bank then Infamous Diner can help – kids can eat for free every day Monday to Thursday from 12pm. Great for a lunchtime or after-school treat. Offer is available Monday – Thursday in January from 12pm. T&Cs; One free kids meal for each full priced adult main meal purchased. Not valid on pancakes, waffles, desserts or starters. Offer is valid 12noon until close Monday to Thursday until 31st January 2016. Not valid in conjunction with any other offer. 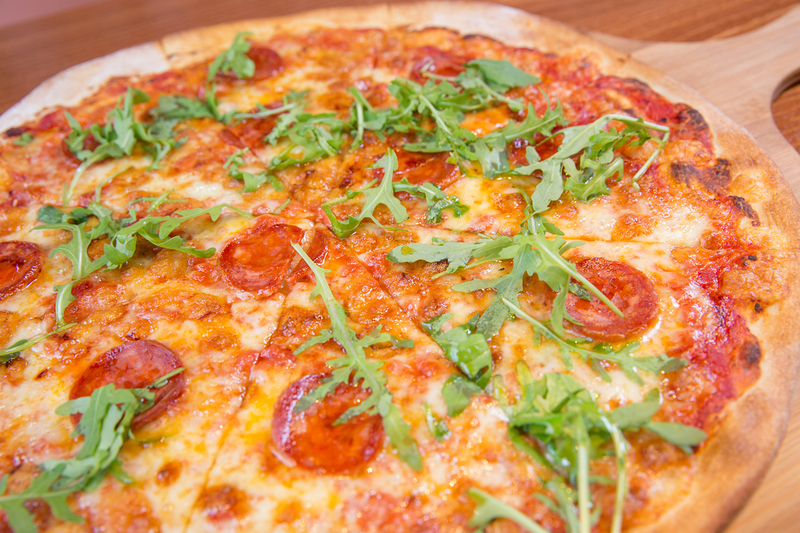 2 PIZZAS AND 2 BEERS FOR £10.10 UNTIL 10.10PM EVERY DAY! 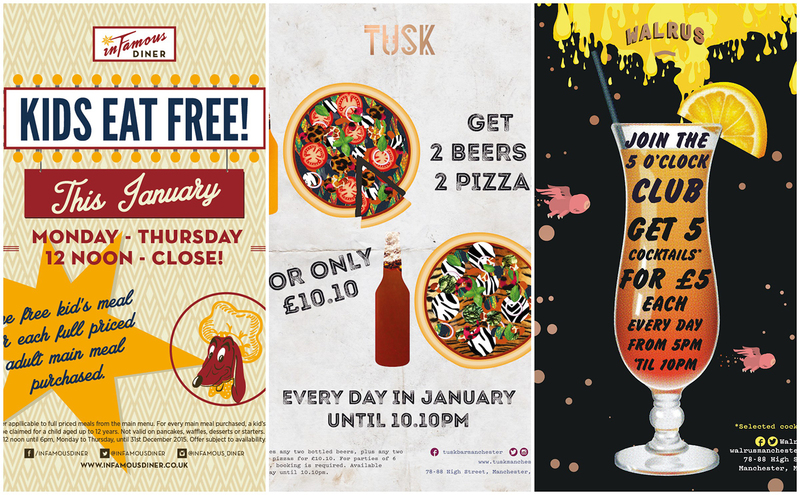 If you haven’t already tried the super tasty pizzas at Tusk then this deal should encourage you! 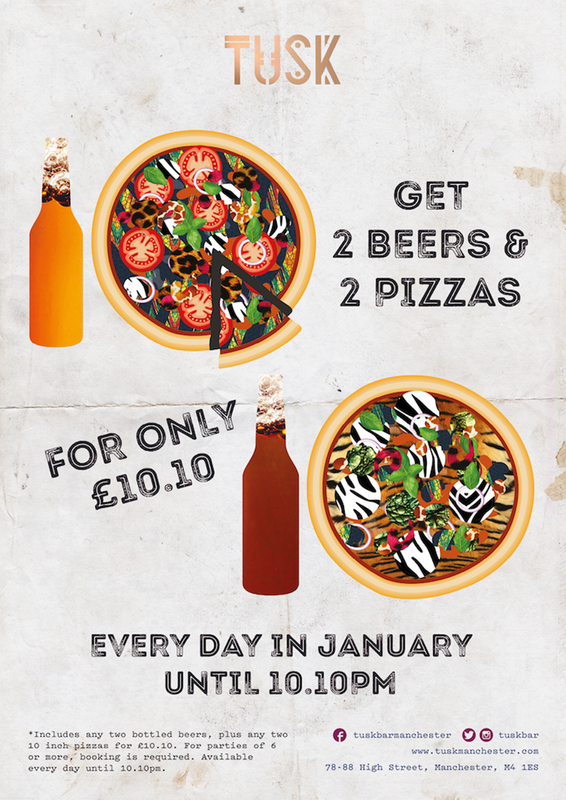 The perfect after work treat this January, get two beers and two 10inch pizzas for only £10.10 – everyday in January until 10.10pm. Offer is available every day in January until 10.10pm. WALRUS: Join the 5 o’clock club! The newly refurbished Walrus is the perfect place to relax after work with friends, with huge comfy booths and a casual dining menu – serving up everything from pizza, to burgers, nachos and sharing boards. 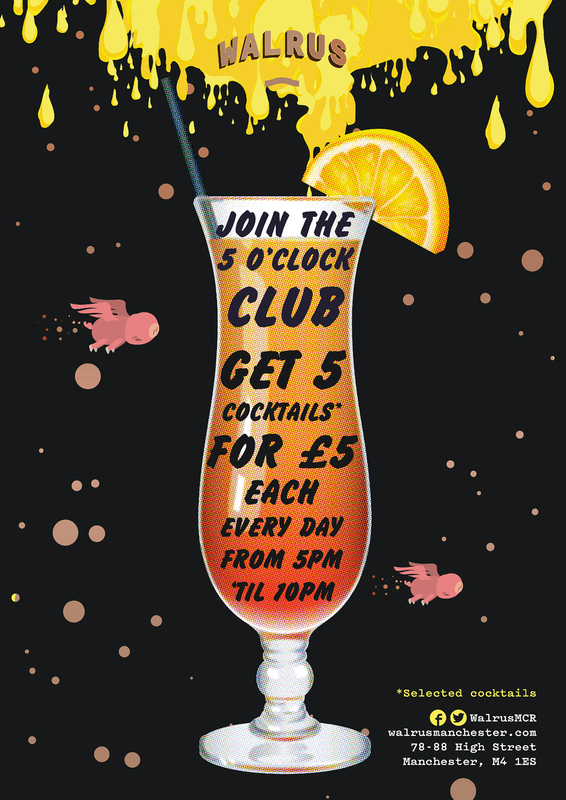 Get 5 of their awesome cocktails for £5 each, every day between 5pm and 10pm. 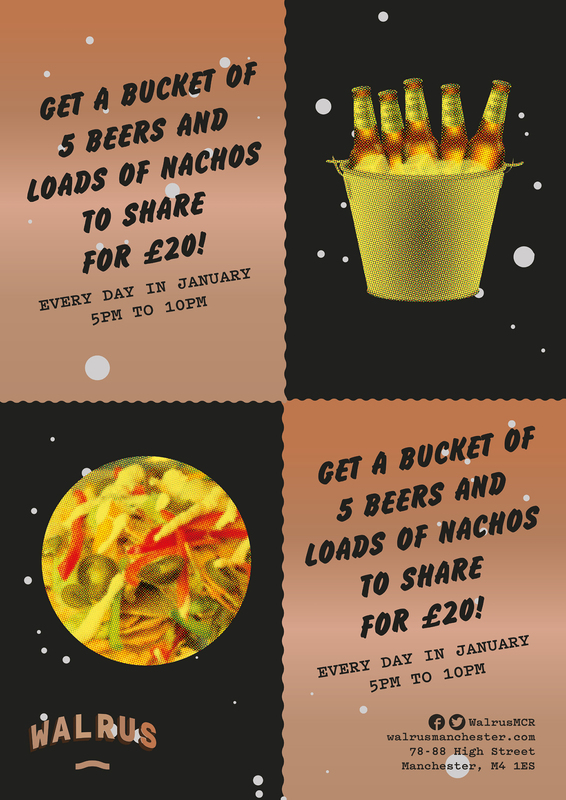 Get a bucket of beers and a shed load of nachos for £20 – great for sharing. Offers are available every day in January between 5pm and 10pm..
T&Cs; Not available in conjunction with any other offer.